Indigenous peoples lived in the Uwharrie area for 10,000 years prior to the arrival of white settlers, because these mountains provided the raw materials necessary for making stone tools. The Yadkin and Pee Dee Rivers were major "highways" for prehistoric man, who first used the narrow channels and floodplains as resting areas and later as camps and villages. Little is known about these early inhabitants, but some of their quarry and workshop sites have been identified. Documentations by a German doctor in 1670 and by John Lawson in 1701 indicate the presence of Siouan-speaking Sapona, Saura and Catawba Indians north, south, and west of Stanly County. Lawson logically assumed that Indians in Stanly County were of those same tribes. The maps of this section of North Carolina drawn between 1701 and 1775 show that little was known of the area or its natural features during that time. And early maps show discrepancies in locations of towns, rivers, and mountains. By 1808, the maps were more accurate and included the settlements and homesites of many of the English, Welsh, and German families in the area. The 1808 maps show a town of "Tindalesville" on the Stanly County side of the Pee Dee River opposite the mouth of the Uwharrie River, a ferry above the town, and three ferries south of it. After an epidemic of typhoid fever and destruction by a tornado, the town of Tindalesville was abandoned. Approximately one mile from the site of Tindalesville (later known as Laurensville or Lowder's Ferry), a Scot, William MacGregor, settled in America to preach in the Baptist churches. His home, along with an apple orchard and 294 acres of land, was purchased by Dr. Francis J. Kron on November 2, 1839. Dr. Kron and his family lived here for the remainder of their lives, building their small farm into a sizable tract at one time containing well over 6,000 acres. In addition to practicing medicine, Dr. Kron conducted many horticultural experiments, supervised the operation of the "plantation", and was an active public figure in the county until his death in 1883. Since his wife had precedeased him in 1873, ownership of the family holdings passed to his two daughters, Elizabeth and Adele. The sisters began selling their property in 1850 and continued to do so for the remainder of their lives. Elizabeth died in 1896 and Adele in 1910, and both were buried in the family graveyard behind the home. By the time the estate was settled in 1912, the remaining land had to be sold at public auction to cover the family debts. The homesite was sold to Horace Armfield, who cultivated the lands around the house. Several people or families lived there as his tenants for some time, but eventually the property was sold to J. M. Morrow, a local landowner and the man for whom Morrow Mountain is named. 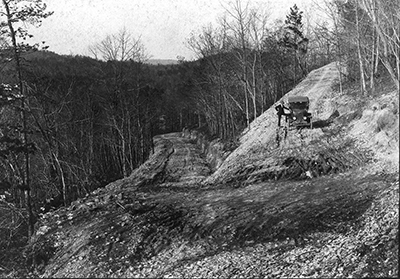 In 1884, one year after Dr. Kron's death, a hurricane stripped what is now Morrow Mountain of its trees, giving the mountain a bald appearance, as can be seen in many old photographs. The mountain then became known as "Naked Mountain." Lowder's Landing, also called Lowder's Ferry, where the Yadkin and Pee Dee Rivers meet, is named for the Lowder family, whose homesite was destroyed by the same hurricane. There was so much local interest for a State Park at Morrow Mountain that a committee formed around 1930 to marshall support for the project. This committee, composed of W. B. Beaver, W. E. Smith, T. R. Wolf, E. E. Swaggs, D. L. Crowell, J. M. Morrow, J. A. Groves, J. H. Morrow, Heath Kluttz, and M. M. Palmer, was instrumental in making the park possible. The committee worked on and was largely responsible for the enactment of Chapter 213, Public — Local Laws of 1935, authorizing Stanly County through its Board of Commissioners to issue $20,000 in bonds for the purchase of land for parks. The land purchased under this program was to be turned over to the state's Department of Conservation and Development for development and administration. During the 1930's the federal government, through the National Park Service, operated a program to aid in the development and beautification of new parksites by readying the areas for use as a park and then turning them over to the states for maintenance. This program was realized as a good method for providing recreation for the citizens of Stanly County and the State, and the details were soon worked out. The first step in the process was to have the park under a master plan, or general development plan, mutually agreed upon by both the state and federal agencies involved. During the month of February 1935, over 1,800 acres of land around and including Morrow Mountain was donated to the State, forming the nucleus of the park and the beginning of the development process. Almost immediately, the Works Progress Administration(WPA) and the Civilian Conservation Corps (CCC) began working in the park, clearing up the area, repairing the existing road system, and beginning work on some of the facilities. The general development plan was officially completed February 25, 1937, but a great deal of work under its general guidelines was already underway. By September 9, 1937, the park ownership was over 3,000 acres, two miles of road had been graded and surfaced, over two additional miles had been graded, the picnic shelter on Morrow Mountain had been completed, and work on the parking lot near the main picnic area had been started. The Civilian Conservation Corps and the Works Progress Administration completed a great deal of work between 1937 and 1942. The WPA completed construction of the swimming pool and bathhouse in the spring of 1939, and worked on the "Uwharrie Lodge" during the latter half of 1940 and the first half of 1941 . Before and during this period the CCC was hard at work constructing many of the other park facilities. During 1939 and 1940, workers completed two entire water systems (one for the swimming pool, another for the other park buildings and use areas), the family picnicking area (including a picnic shelter, toilet buildings, septic systems, and picnic tables), a 100-car parking area at the lodge, and the concession building at the swimming pool. By 1942, before the CCCC Camp disbanded, two ranger's residences, part of the maintenance and service area (a garage tool house, and shop), a barn, a barracks for summer employees, and enlargement of the parking area on top of Morrow Mountain had been completed. Morrow Mountain State Park was officially open for public use on August 17, 1939, but the park dedication ceremonies were not held until June 29, 1940. This day-long celebration included a parade in Albemarle, addresses by the Governor and a long list of dignitaries, a water carnival, and a bathing beauty contest. In 1947 the park received a $93,000 appropriation for new development, and from 1945 to 1948, the park underwent a large-scale maintenance. 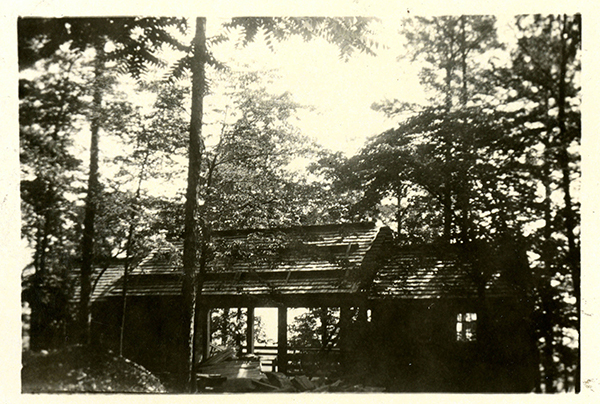 This appropriation covered construction and paving of park roads and parking areas, enlargement of existing picnic areas, and construction of part of a tent and trailer camping area, a boathouse and boat dock, a ranger's residence, workshop, storage building and garage, and six vacation cabins and their associated utilities. By 1954, the tent and trailer campgrounds were in operation, development of the boathouse area was complete, and the natural history museum had been constructed. Plans and surveys were underway in 1964 for a road to the proposed Kron House restoration as well as plans for two new family camping area washhouses. By 1966, two new 30-site camping areas and bathhouse additions were complete, the road to the Kron House had been paved and a new residence and garage addition constructed. materials used by Dr. Kron in some of his horticultural experiments. Additional gifts of land and land acquisition efforts continued between 1935 and 1939. Carolina Power and Light leased the lands along Lake Tillery to the State Park in December of 1941 for 99 years, bringing the size of the park to 4,215 acres. In 1968 an additional 293-acre ttract 293 was purchased. The current park ownership now totals approximately 4,508 acres. North Carolina Division of Parks and Recreation. Morrow Mountain State Park. http://www.ncparks.gov/morrow-mountain-state-park (accessed December 11, 2015). Resources on Morrow Mountain State Park, North Carolina Digital Collections, http://digital.ncdcr.gov/cdm/search/searchterm/morrow%20mountain/field/s... (accessed December 11, 2015). Photographs relating to Morrow Mountain, from the collection of the Stanly County Museum, Albemarle, N.C.
North Carolina Division of Parks and Recreation. [Picnic shelter, top of Morrow Mountain.] Photograph. ca. 1944. State Parks Collection, NC Digital Collections. North Carolina Division of Parks and Recreation. [Gentleman poses with his autombile for a portrait at Hairpin Turn.] Photograph. ca. 1920. Collection of North Carolina State Parks. 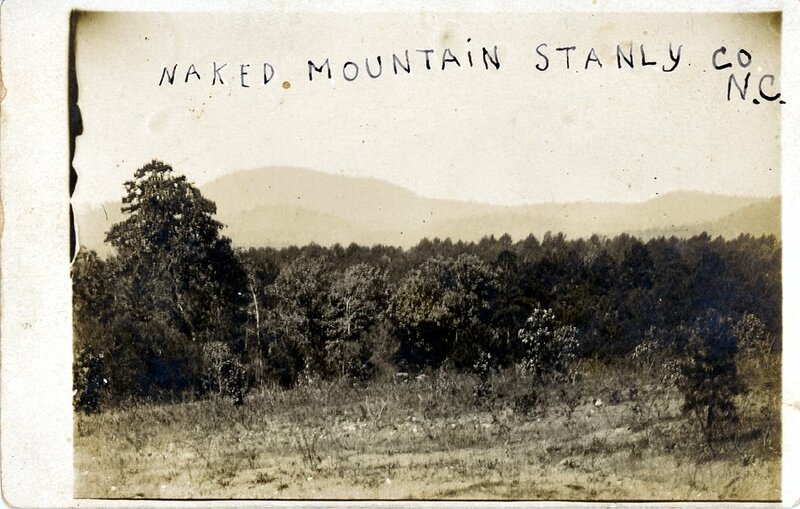 "Naked Mountain Stanly Co N.C." Photograph. ca. 1920. Stanly County Museum collection. http://stanly.pastperfectonline.com/photo/C1CCB08A-B390-4E21-AF07-053657... (accessed February 8, 2016).